The Harrison Standby Camera Cover, Large is a lightweight and waterproof equipment cover made to protect a 35mm motion picture camera or Steadicam rig from dust or rain when not in use, or when emergency weather protection is needed. This cover will also work with a professional video camera. The bottom of the Standby Cover has a drawstring to secure the cover when you walk away. A Mini Stuff sack to carry the cover is included. Lightweight, waterproof cover protects equipment from dust or rain. 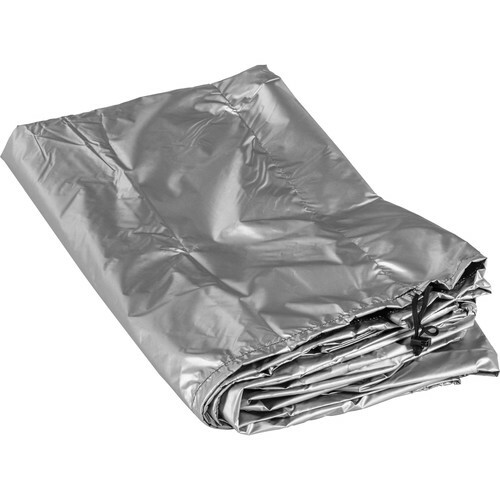 Silver on the outside protects equipment from direct sun. Box Dimensions (LxWxH) 9.0 x 8.7 x 3.4"
Standby Cover, Large is rated 3.5 out of 5 by 2. Rated 2 out of 5 by Anonymous from Not sure i'ld buy it again The cover is thinner than I expected. I like the draw string but I'm afraid it will rip. The inside of the Harrison Standby Camera Cover is black.